".... let us examine some of the "rest of the story." It is true that the Civil War left San Augustine in economic depression. Two major sources of capital investment -- slaves and land -- no longer had value. Slavery was "gone with the wind" and few had resources to purchase the land. But cotton gins, a gristmill, sawmills abounded..."
The Rev. George L. Crocket, a native of San Augustine and also its best known twentieth-century clergyman, published a history of San Augustine in 1932 titled Two Centuries in East Texas. It has become a classic. Crocket provided a detailed narrative of San Augustine from the time of the Ais tribe, a part of the Hasini confederacy, through post-Civil War Reconstruction, or approximately to the beginning of his own life. A brief conclusion suggests the notion that Crocket did not believe that much of importance happened in San Augustine after the Civil War. Perhaps in a future visit we can explore the founding and nurturing of a younger community, but this time let us examine some of the "rest of the story." It is true that the Civil War left San Augustine in economic depression. Two major sources of capital investment-- slaves and land -- no longer had value. Slavery was "gone with the wind" and few had resources to purchase the land. But cotton gins, a gristmill, sawmills abounded. A fire in 1890 damaged part of the town, but rebuilding removed the scars and a new courthouse was built. Two newspapers, the Herald and the Saxon, were published. Townspeople could attend five churches and patronize seven general stores and more specialty shops. The Gulf, Beaumont, and Great Northern Railway reached San Augustine in 1901, and Santa Fe Railroad acquired the line two years later. The railroad provided transportation for lumber produced in San Augustine, enabling an expansion in sawmilling and jobs. By 1914 over 1,300 souls called San Augustine home. By then they could read the Tribune or the Cotton Belt News, talk over a local telephone exchange, and purchase nostrums from R.N. Striplings' pharmacy. They could deposit funds in the First National Bank and enjoy city-provided water, sewage, and electricity services. 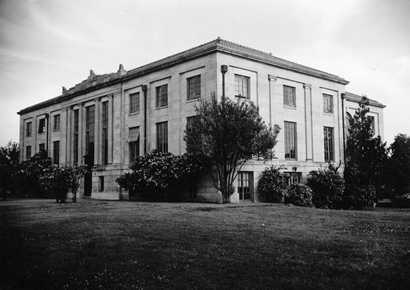 In 1927 San Augustinians built yet another courthouse, this time a two-story structure made of stone. Then, America entered its most significant economic stress. "The Depression" says it all. Businesses closed, farm products brought little revenue, and lumber companies moved on after cutting most of the timber. Help from such New Deal agencies as the Civilian Conservation Corps and the Works Progress Administration saw the town through the worst of it, but the greatest help came from a federal program for rural electrification. This resulted in San Augustine's selection as headquarters for the Deep East Texas Electric Co-Operative. World War II and postwar prosperity allowed San Augustine to grow again. By 1990 the city counted 180 businesses, banks, drug stores, ten churches, and a population of nearly 2,500. And it had learned to capitalize on tourism from the attraction of nearby lakes and its own history. Quite a lot happened in San Augustine in the third century beyond George Crocket's chronicle of it. This column is provided as a public service by the East Texas Historical Association. Archie P. McDonald is director of the Association and author of more than 20 books on Texas.